If you’re in need of academic support services from the Accessible Learning Centre (ALC) for classroom or examination accommodation, you are required to self-identify and provide current documentation from a registered healthcare professional (e.g. physician, psychologist or psychiatrist). This intake process is for new students to Laurier or current students new to using the ALC's services. You can begin the intake process as soon as you accept an offer of admission to Laurier. It is in your best interest to begin the intake process as soon as possible. Complete the Online Student Application form where you will be asked to upload current supporting documentation. A medical form and an ADHD verification form are available for your convenience. These are both printable forms that have been tested for screen reader accessibility. The forms can be read with a screen reader; however, they cannot be completed with a screen reader. Should you require assistance, please contact our main office at 518.884.0710 x3086 for support. The ALC will review the submitted application. This may take five to 10 business days. The ALC will contact you requesting additional information or to schedule an appointment with a disability consultant. Attend your appointment with your disability consultant to discuss your learning needs and review your documentation. If you have provided documentation that needs to be updated (e.g. an assessment that is more than three years old, an IPRC from high school, etc. ), we will discuss documentation requirements, possible interim accommodations. Current students that are already registered with the ALC can log into Accessible Learning Online using single sign-on credentials to view their profile. Once you log in, complete the Annual ALC Consent Form and update your profile information. The purpose of the consent form is to renew accommodations for the current academic year. This does not negate the need to meet with the disability consultant if it is necessary. An appointment may be requested by the consultant or student if there is a specific need (e.g. to review outstanding documentation, health status or learning needs have changed, or to request a bursary). Completing the consent form and updating your profile information allows you to access your needed accommodations and ensures a strong beginning to the term. To access Accessible Learning Online and to activate your accommodations, follow the steps below. Log in to your Accessible Learning Online profile using your Laurier username and password. Annual ALC consent form confirmation: If you have not submitted your form, you will be asked to do so when you log in. Review "Your To Do List" on your ALC profile overview. Items that require your attention are displayed on this page. Once you've cleared your "to do" list, you can start selecting your accommodations. 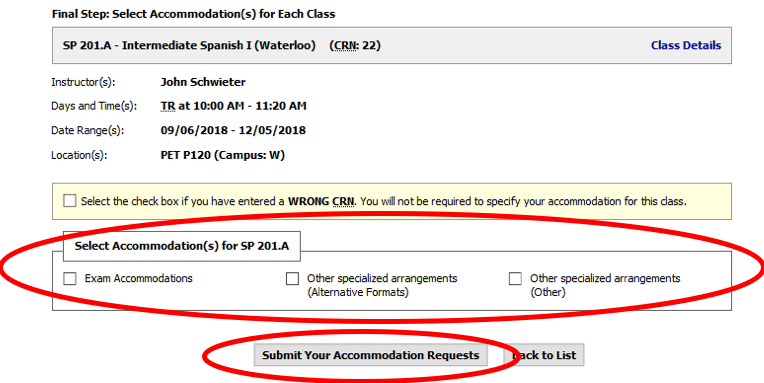 Scroll to "Step 1: Select Class(es)" under the heading "Select Accommodations for Your Class" and select the checkbox of the class you would like to request accommodations for. Note: Only courses you are registered in will appear (i.e. 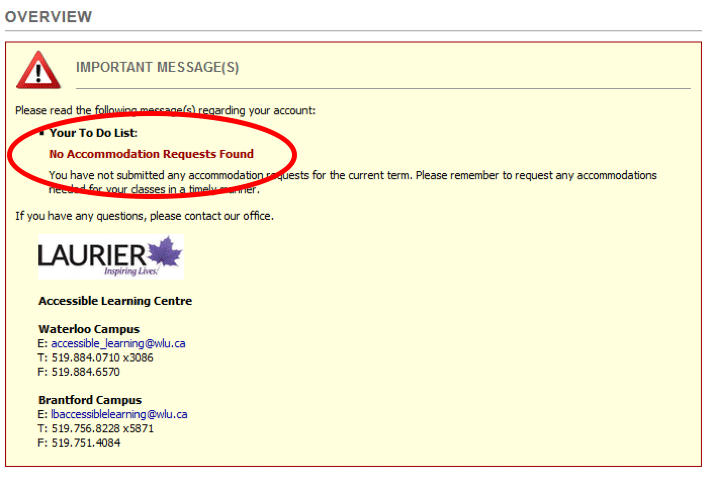 you cannot request accommodations for waitlisted courses). Choose "Step 2 – Continue to Customize Your Accommodations" to continue. 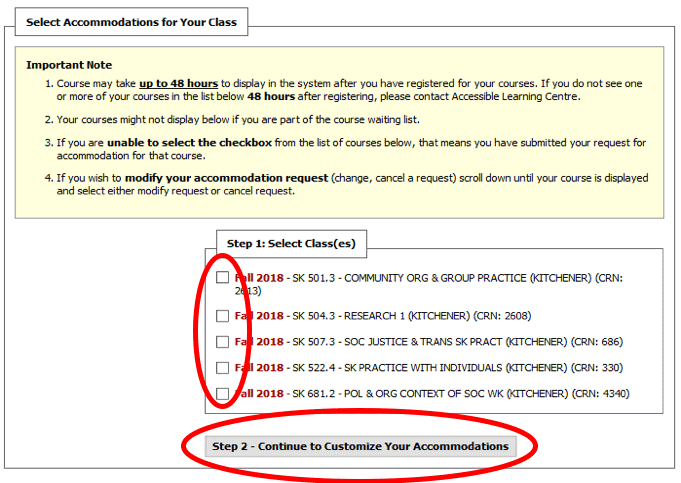 Select the accommodations you wish to access for each course. Consider the format of the course before requesting an accommodation (e.g. the ALC does not provide note takers for online courses). Choose "Submit Your Accommodation Requests" to submit your request. The ALC will send the Faculty Notification Letter with your accommodation needs to your instructor. If you have successfully completed your ALC registration, your screen will display a "System Update is Successful!" message. Note: This does not mean that you have booked your tests/exams/in-class assignments.